January 22, 2011 - no comments. Posted by Larz in Events. We hot-foil stamped some special Mary Papers cards from Suckpax series 2. They are for the closing party at the Boo-Hooray Suckadelic show, which Mary will be attending. These have both the Gold M stamp, and a special Boo-Hooray black foil stamp also. Finished about 40 of them. 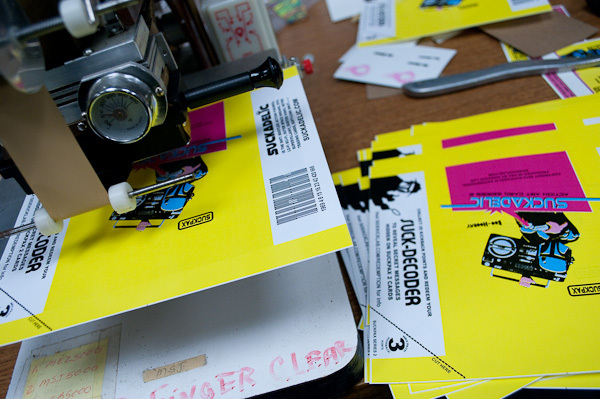 5 boxes of wax packs were made with special Boo-Hooray show. The have black foil stamping on the outer wrappers, and are available at the Gallery, and the online show store as loose packs. 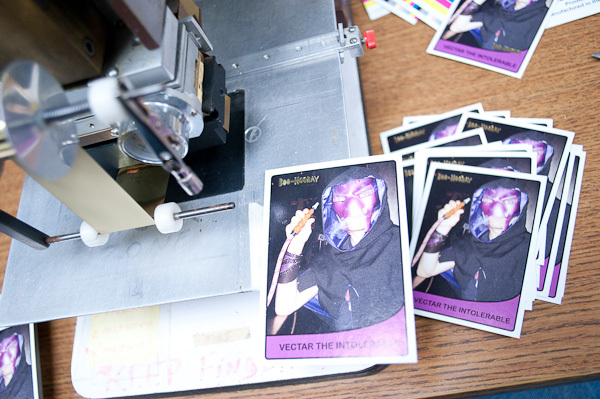 300 Gold stamped Boo-Hooray Vectar cards were created for the closing show. This card is from The Art Hustle series 1.